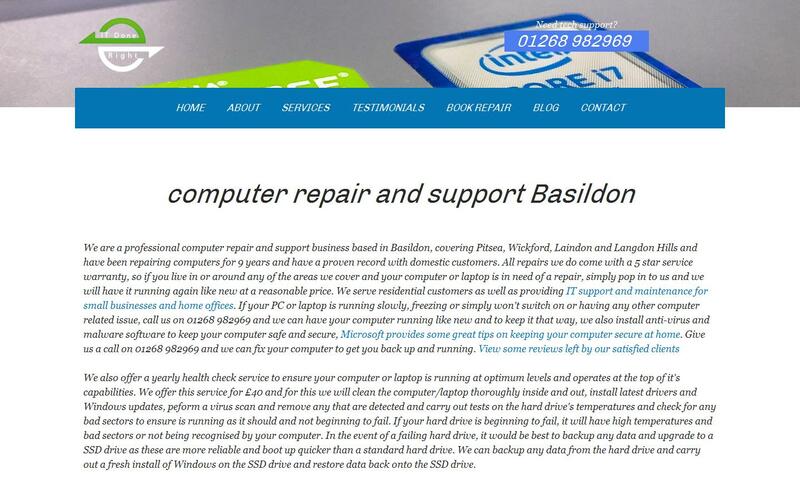 We are a professional computer repair and support business based in Basildon, covering Pitsea, Wickford, Laindon and Langdon Hills and have been repairing computers for 9 years and have a proven record with domestic customers. All repairs we do come with a 5 star service warranty, so if you live in or around any of the areas we cover and your computer or laptop is in need of a repair, simply pop in to us and we will have it running again like new at a reasonable price. We serve residential customers as well as providing IT support and maintenance for small businesses and home offices. If your PC or laptop is running slowly, freezing or simply won't switch on or having any other computer related issue, call us on 01268 982969 and we can have your computer running like new and to keep it that way, we also install anti-virus and malware software to keep your computer safe and secure.